Man City players celebrate win against Arsenal at the Emirates Stadium. Manchester City looked like they are ready to defend their title with a convincing 2-0 win away at Arsenal. The Premier League title have not been retained since 2008/09 season but City are looking as strong as ever in their first game of the season. It is going to be a tough at the top of the League as Liverpool have also started the season in blistering fashion with a 4-0 home win against West Ham, Chelsea will improve with arguably one of the best coaches in Europe, Tottenham keeping all their top players and you can't writeoff Jose Mourinho's United despite his early struggles this season. 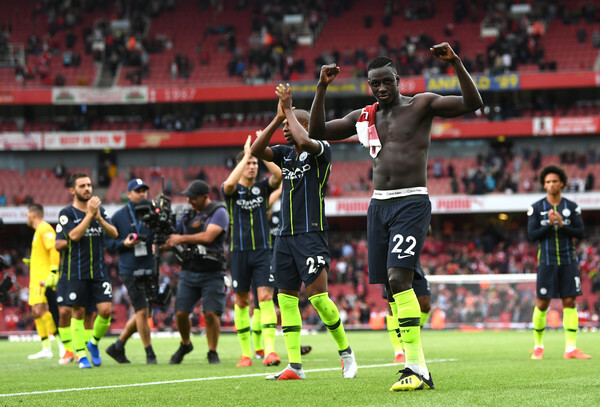 Pep Guardiola's men were sharp at the Emirates as they ease pass Unai Emery's Arsenal, their passes were intricate as ever, Pep's tactics is evolving this season as Raheem Sterling and Mahrez cut into the middle with Walker and Mendy bombing forward at every opportunity unlike last season where the fullbacks join tuck into the middle for Sane and Sterling to stay wide. The tough start to the Premier League campaign has not made it easy for Unai Emery, he has a lot of work to do with his players and there are signs of improvements with their smart pressing, their forward players put pressure on City's defence forcing them into errors that led to goal scoring chances. Defensively, the gunners looked shaky and Cech did not help matters when they want to play out of the back. Click on this link to watch Sterling score to give City a 1-0 lead at Arsenal. Click on this link to watch Bernardo Silva's brilliant goal to make it Arsenal 0-2 Manchester City.